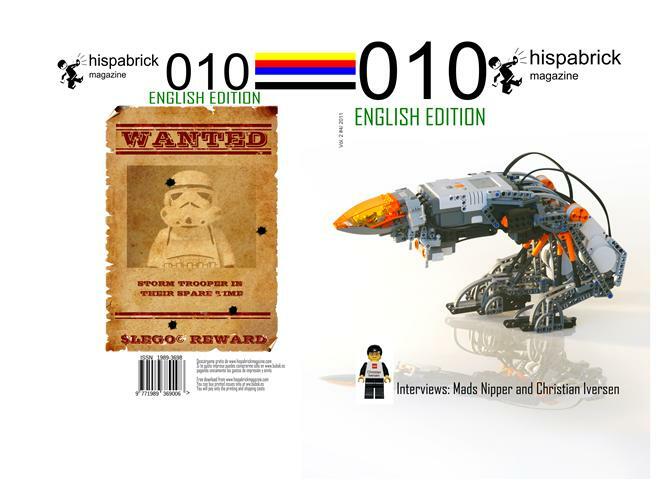 Hispabrick Magazine 010 is out, and this month it features an interview with Menno Gorter, The Walker Dutchman. As you can see, Menno's latest creation, the Tripod, has made the cover of this edition and in a special collaboration between Hispabrick Magazine, TBs and Menno Gorter, we are offering you an exclusive look at his work and especially this latest creation. Menno: There was LEGO in our house even before I can remember. My mother was a kindergarten teacher and fortunately she soon realized the great educational value of LEGO. It teaches you to think systematically, spatially and problem-solving; I can sincerely recommend it to all of you! Only then I had to share everything with my two sisters and brother. Later on we got electric motors and rails – that must have been my father’s input; he was a civil engineer. By the time I was twelve I already earned some money and I was the only one in the family who spent his own money on LEGO, and eventually all of it ended up being mine as I was the only one who continued using it. I’ve never really had a dark-age; the way I used LEGO was not usually considered childish and that kept motivating me. I did have a period when I felt I was the only one to still “play” with LEGO (I keep calling it playing, because playing with LEGO is fun…  ). That lonely period lasted quite long, until about halfway the 90s when I got in touch with De Bouwsteen, a then still small LUG. Ironically the first thing I was asked by this LUG was whether I was a builder or collector. When I explained what I did with my LEGO the reply I got was that I was neither of those. There were no members then who used Technic the way I did. HBM: So when did you start with LEGO Technic? Your oldest walker on BS is from 1979! Menno: I built my first reasonably working LEGO walker in December 1972, only I didn’t make pictures of my creations back then. I did already have LEGO motors, but in 1972 I got one of those sets with gears, universal joints and tread links and that opened up a whole new world of possibilities for me! In short, it was a construction that had something like the push rods of a steam engine and as a result it did not so much roll as walk with a walking frame. Before that I had tried something similar with the white turntables on the red rims that were available then, but the result was not what I wanted. Later on I have even created six-legged walkers with really old LEGO. There were so many more possibilities after the introduction of LEGO Technic! That’s the kind of walker you can see in the 1979 picture in my BS folder. HBM: LEGO Technic has changed a lot over the years. To what extent do those changes affect the way you build your models? Menno: If you were to step straight from the time of the 850 into present day Technic you’d probably not know where to start It’s simply a challenge to make the most of what you have. During my time in MPD (the NXT beta test program) some complained about the rough shapes of NXT motors and sensors. I looked at it differently. Instead of building that big motor into something you need to use it as a starting point and attach things to those motors. It’s hard to find more sturdy elements! New elements mean new possibilities. HBM: Some people say it is a pity there are no better pictures of those creations and it is virtually impossible to see any construction details. Why is that? Menno: I don’t like to show technical details. You need to be able to see something works, but not exactly how – people will spend more time watching models that way. Additionally, I believe that if you want to learn something you shouldn’t simply copy or follow building instructions. I am absolutely against the current ‘cut and paste’ culture. And to make things worse there are even people who claim those copied constructions as their own. Another reason is that I spend most of my day working with photographs. Since 1996, photography is an important part of my job, so at home I’d rather build than take pictures. Anyway, when I did take more detailed pictures people were always asking for video footage and I suppose now they’d want building instructions… I do make videos now so people who cannot come to any of the events I go to can see my creations in action. If you want to read the rest of the interview you can also download Hispabrick Magazine for free or read it online. I think I must be living in a different universe. After "playing" with LEGO since 1977, and visiting this blog for about a year regularly, this is the first time I hear about the Hispabrick magazine. It's actually awesome! Of course I'm very proud to be in the Hispabrick Magazine and the Hispabrick editors should be very proud making again a good looking magazine containing a total of 82 interesting pages. BTW does anyone or nobody have questions about the Tripod or the interview? I'd say; eat your hart out! To be honest: I expected a bit more discussion, not only about the Tripod but the interview or the whole magazine as well. There are more Technic related articles in Hispabrick Magazine 010 for instance. I must say that usually I know the answers or have some good hints, to my questions beforehand. Only I'm pretty sure a Tripod isn't easy to control by remote; even the NXT has a lot of problems to control three motors exact. That's why I've added extra sensors to each leg in order to detect in which position the legs are, in case the internal motor sensors are missing something. Including the build in motor sensors NXT-Tripod is using 9 sensors. 2 for each leg and the rest for detecting obstacles. I would like to congratulate you on the article in HBM. It was great to read the article. Good questions and great answers. The Tri-pod is a tipical Menno creation. Special, lightly build, strong, simple in build, but ingenious. All your work all these years..., You deserve it to be in the HBM. :-) I gave two identical links; sorry. The construction of the Tripod is a kind of Monocoque: everything is mounted directly to the NXT. What you see under the NXT is mainly a bunch of cables! Same about the motors; like I said in the interview: it's hard to find more sturdy elements! So the motors are the main part of the legs too. Like I did in the NeXTosaurus/Nxt2saurus, the NXT-Coyote and the NXT-Cricket before. Congratulations on the article, Jetro and Menno! I too find walkers fascinating, but I'm nowhere near anything as even slightly competent in the subject: I have under development an RCX-powered pneumatic hexapod (using an alternate tripod gait) for almost two years now, and it has serious valve control and structure integrity problems. Regarding the Tripod: I love it! The first thing that popped to my mind when I watched the video was "Harkonnen Devastator!" (from the Emperor: Battle for Dune game) :D They have slightly similar looks, and move in practically the same way. This is the best video I could find with Devastators (does anyone know of a video that better shows them? ): they appear between 0:20 and 0:25. I wonder if you got inspiration from this unit to build the Tripod, or was it a case of convergent evolution? This leg configuration is quite simple and effective but not the first that came to my mind. The first attempts had more triangle shaped alignments. For me the NXT-Tripod started as a cross-over between the Nex2saurus and the NXT-Coyote. the centre leg moved via some kind of differential mechanism. It worked, only it was complex and the balance didn't allow me to make the desired shape.